One of the most popular muckraking American journalists of the late twentieth century, I.F. Stone, once remarked: “All governments lie.” Even a prominent government official — Andrei Gromyko, the veteran Soviet diplomat — once admitted, in a weak moment: “Governments are never sincere.” This gloomy assessment appears all too true when it comes to national security policy, and particularly so with respect to nuclear weapons. Indeed, in early March, a new Japanese political party — swept into governmental power last year thanks to a political upheaval — revealed that its predecessors had lied for more than four decades about one of the most hallowed principles in Japanese public life: Japan’s nuclear-free status. In 1968, Japan’s ruling conservatives — the misnamed Liberal Democratic Party (LDP) — under enormous pressure from an antinuclear public, had proclaimed Japan’s Three Non-Nuclear Principles: the government would not manufacture, own, or allow the entry of nuclear weapons into Japan. Ever since that time, there has been considerable controversy over whether U.S. warships in Japanese harbors were armed with nuclear weapons. As it was hard to imagine how U.S. nuclear warships could dispose of their nuclear weapons before entering Japanese harbors, massive antinuclear demonstrations erupted in Japan’s port cities. Meanwhile, the U.S. government refused to confirm or deny that its warships carried nuclear weapons, while the Japanese government swore that they did not. In recent years, although occasional statements by U.S. government officials indicated that nuclear weapons were probably entering Japan aboard U.S. warships, the Japanese government clung to its lies. The latest denial was by Taro Aso, the last LDP prime minister before the new Democratic Party of Japan administration revealed the long record of deception. A Foreign Ministry official told the Associated Press that he and other high-ranking officials of the past feared that disclosing the agreements with the American government to bring nuclear weapons into Japan would have created massive upheaval in Japanese life and, perhaps, toppled the prime minister. “The political costs were too great,” he explained. Actually, in the case of nuclear weapons, the Japanese government had been playing a double game for years. During the 1950s, Japanese officials issued numerous protests against nuclear weapons testing that were designed less to halt the testing than to soothe public opinion. In May 1956, the Japanese ambassador explained that his government’s protests were “largely a public opinion matter inside Japan.” The following day, secretly apologizing for delivering a diplomatic note calling for a halt to U.S. nuclear testing — and “off-the-record,” expressing his disagreement with it — the second in command at the Japanese embassy depicted it as an attempt to woo parliament and public opinion. In the early 1960s, when the U.S. government resumed underground and, later, atmospheric nuclear testing, the Japanese government again assailed nuclear tests, but as in the past accompanied such statements with private assurances to U.S. officials that the protests had been made “to offset domestic political pressures.” Secretly, some Japanese officials went so far as to remark that they favored Japan’s development of nuclear weapons. Thus, the Japanese government’s duplicity in connection with the Three Non-Nuclear Principles should not come as a total surprise. Of course, lying about nuclear weapons has not been limited to Japanese officials. The French government argued for years that it was developing nuclear energy solely for peaceful purposes — until it abruptly moved forward with its nuclear weapons program. The Indian government denied that it had conducted a nuclear weapons test in 1974, when it set off a “Peaceful Nuclear Explosion.” Meanwhile, the Soviet government, while posing for decades as a fierce foe of nuclear weapons, developed the world’s largest nuclear arsenal. As for the U.S. government, it lied for years about the dangers of nuclear testing, downplayed the ability to detect nuclear testing and development abroad, and made nuclear disarmament offers based on their propaganda value. One of the more interesting nuclear gambits has been pursued by the Israeli government, which has never admitted that it possesses nuclear weapons — although that government had Mordechai Vanunu kidnapped, tried, and locked in prison for eighteen years (eleven of them in solitary confinement) for the “crime” of publicly revealing their existence. 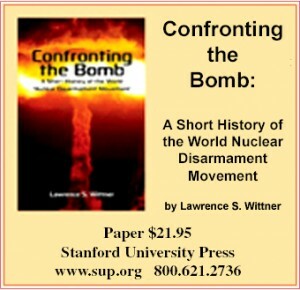 In addition, one might ask what has been done to honor the pledge, made at the nuclear Non-Proliferation Treaty (NPT) review conference of 2000, for an “unequivocal undertaking by the nuclear weapons states to accomplish the total elimination of their nuclear arsenals?” At the moment, there remain more than 23,000 nuclear weapons, 96 percent of them in the hands of Russia and the United States.